The good news about my ten day recovery, is it was a great spot to be in, because there were so many great things for Mozart to do while I rested and recuperated. The bad news is we had to revamp our itinerary again and we had to cut out a lot of things that we were looking forward to seeing and doing. This knocked the wind out of my sails, plus with the timing we knew we would have to let go of our plans to see quality opera in nearby Bratislava, Slovakia for bargain prices, touring Budapest and the famous spa treatments there, and a fun dip into Romania via train to see the countryside, pretty towns and Dracula’s castle. Sigh. We would have to also cut short many of the musical things we had planned for Vienna. There was a sense of loss because I am not sure if we will get back to them or Krakow or not, but it did not seem prudent at this point. I knew the hospital was great in Vienna and until I felt really strong and confident that I was back to myself, I did not want to venture into any place that might be a bit risky. The weather was also getting colder and DaVinci wanted to get out of this northern area and through the high mountains before the snow and bad weather set in. I suppose, we might have guessed as we entered this campsite that we might be in for an adventure here. Our GPS led us to a large river and a teeny tiny ferry on the day we arrived, as the only way to get to the campsite. We weren't sure what to do and the lady in the car in front of us waiting, was not sure if the ferry could handle a vehicle as large as ours. The old man who runs the ferry though, said it was alright and we ambled on with two other cars. Yet another ferry crossing and new mode of transportation on this trip! Cities are not the greatest for kids, so what we prefer to do is stay in a town or suburb nearby a big city and take public transportation in. That way Mozart can run around and play and be a regular kid on days we are not touring. This campsite, (http://www.tiscover.at/at/guide/5,en,SCH1/objectId,CPS175746at,season,at2/home.html) was perfect for our needs and the extras proved to be a bonus for Mozart, while we had many lazy days waiting for me to get my strength back. I had no pain, but I lost a lot of blood so felt very weak for about ten days, gaining a little more strength each day. In the beginning I was in that state where you just feel like crawling into a ball and not moving. I was even extra sensitive to light and sound which surprised me. I was very surprised that I felt this wounded for this long. One of the most annoying things later was the pack in my nose, which got itchier each day and made me sneeze, which I was told to try not to do. I became a master at sneezing out my mouth and used all my willpower to resist the temptation of pulling the darn thing out. The doctor said that with the help of one of the medications he had given me, that it would disintegrate on its own. Right when I was positive that would never happen, it finally did, almost like magic, as it somehow went from me ready to rip it out to suddenly realizing it was finally gone on its own. They had a huge, fantastic indoor pool complex at this campsite which Mozart just adored. I never got to see it, but they brought me pictures and video to keep me in the loop. They had many pools, including one that made waves, that she had a blast in. They also had a fantastic park and a separate big trampoline center just feet away from our camper that she also adored and spent many hours using. The days were mostly crisp and sunny, so even though we missed out on some things planned, it turned out to be a sweet time for us. Mozart got lots of home schooling and piano practice in and was in absolute heaven with the play opportunities here. 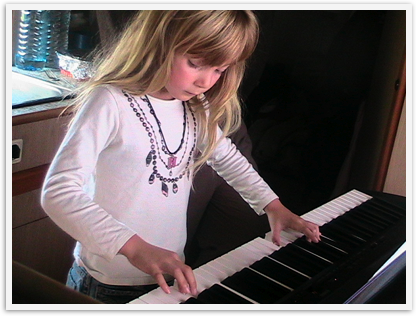 I am always amazed when I watch her play violin and piano and love to see how she concentrates. She makes it look so easy, but I know how hard it is. She gave me lots of nice “performances” and I enjoyed every one. She was reading Harriet the Spy for the umpteenth time and I always get a kick out of how that affects her play and writing. She has put together her own spy kit. She made countless books and made lots of get well “presents” for me. There was an internet cafe close by, so DaVinci could handle things with that while we relaxed or read in the evening, sometimes we joined him towards the end. They even had a fantastic restaurant with take out Chinese food right by the entrance. Mozart’s favorite food has always been Chinese, so we really enjoyed indulging in that several nights. We have a favorite place at home and this one gave them a run for their money. It has been hard for us to find good Chinese food in Europe, this being only the second one so far, thus we were all pleased as punch. When we started the trip, we had promised Mozart we would get her a little tea set that she wanted, as we would see them in Andalusia and we knew they came from Morocco. We saw them in several places in Morocco, but kept waiting for the right place to get the best price. Sadly, when we were ready to buy, there were none around. So then she got the idea when planning her birthday in Salzburg that she wanted everything Mozart including a Mozart tea set. I did not think there was any such thing, but we looked for some in Salzburg and did not find one, so we were back to promising to buy her one of the Moroccan ones in Spain. Then, lo and behold, we actually stumbled upon a Mozart tea set in Vienna! She will probably still get the little brass one too, but this little porcelain one, hand made in Germany, looks like a keeper. There was an Disney looking castle that we viewed from our camper window along with the colorful fall leaves. As Gump’s mother said (and one of Mozart’s favorite sayings) “Life is a like a box of chocolates and you never know what you are going to get”. This particular “piece” turned out much different than we imagined, but mighty tasty just the same.